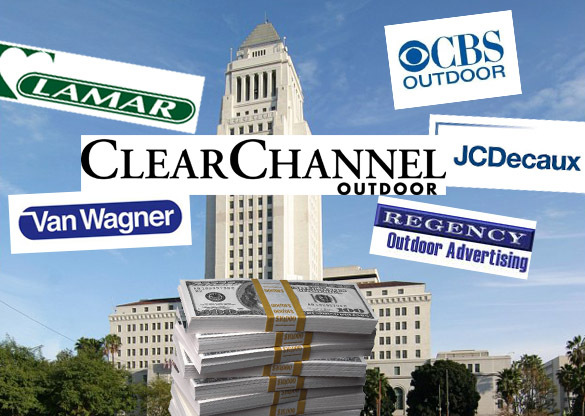 Clear Channel, CBS Outdoor and other billboard companies spent more than $1.5 million lobbying city council members and other L.A. officials in the first six months of this year, according to reports filed with the City Ethics Commission. That’s more than three times the amount the companies spent lobbying in the same period of 2012. By far the biggest spender was Clear Channel, with $570,000 reported in payments to six different lobbying firms. The Texas-based company has been pushing council members and other city officials to approve a deal to legalize digital billboards recently shut down by court order. Clear Channel is also likely to bid on a lucrative new contract to provide commercial advertising signage at LAX if the City Council approves a massive sign district proposed for the airport. Other companies writing big checks to lobbying firms were CBS Outdoor, which owns some of the now-dark digital billboards; JC Decaux, the French billboard giant that holds the current LAX signage contract, and Summit Media, the small billboard company that successfully sued the city to overturn the 2006 lawsuit settlement that resulted in Clear Channel and CBS Outdoor converting 101 of their billboards to digital.